One of the first lessons taught to our Members is the importance of thinking in terms of all mankind and our service in the world. 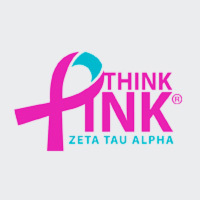 Nationally, ZTA has adopted Breast Cancer Awareness and Education as our national philanthropy. Many of our members feel immediately connected to ZTA because of their personal and family experiences with breast cancer. We feel honored to work toward a cure that is likely to come full circle and directly affect each of us in the future. We do our part here at Gamma Tau by holding Texas Tech-wide events in the spring and fall. During October, we celebrate Breast Cancer Awareness Month with our very own PINKTOBER. The month is full of Zeta Pink events both on campus and in the community. This year, Zetas hosted a "Kiss Cancer Away" table to raise awareness while giving away Hershey kisses and we chalked Greek Circle and Tech campus with supportive messages and facts about breast cancer. Also once to twice a semester in addition to our larger events we host "Cupcakes for the Cure" outside our lodge on Monday evening after chapter where we sell sweet treats donated by our chapter and local organization around Lubbock for $1 each and all proceeds go to the ZTA Foundation. Each year we hold our annual Big Man on Campus male beauty pageant in the fall and ZTA Pancakes for the Cure in the spring to raise money for the Zeta Tau Alpha Foundation. We have been proud to raise over $75,000 each biennium for ZTAF and our philanthropy.